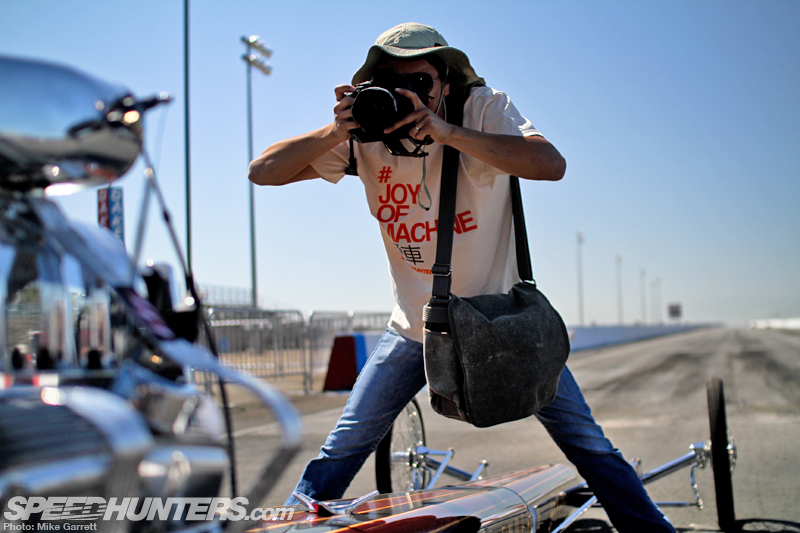 Vintage dragsters, Mexican food and cameras. 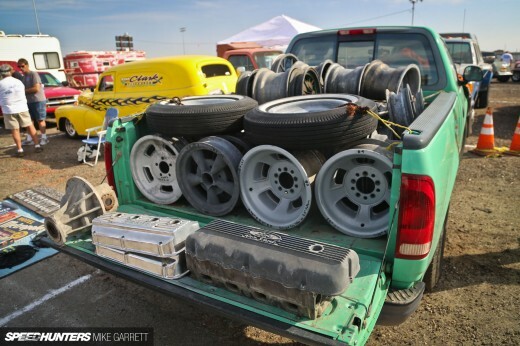 Each of those things are awesome, and each of them were part of a recent Speedhunting expedition in California’s central valley. 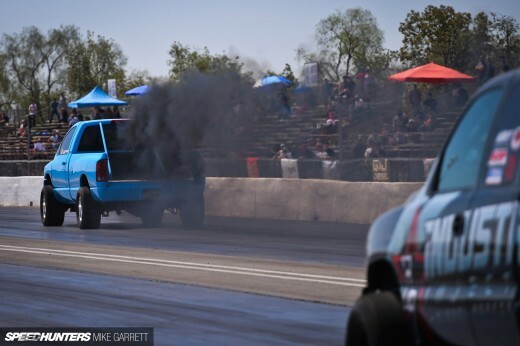 More specifically, the setting was the Famoso Speed Shop and our goal was to capture the shop along with a handful of its awesome drag machines. We have some very cool content from Famoso coming down the pipe, but today I’d like to share some of the behind the scenes action from our interesting day of shooting. 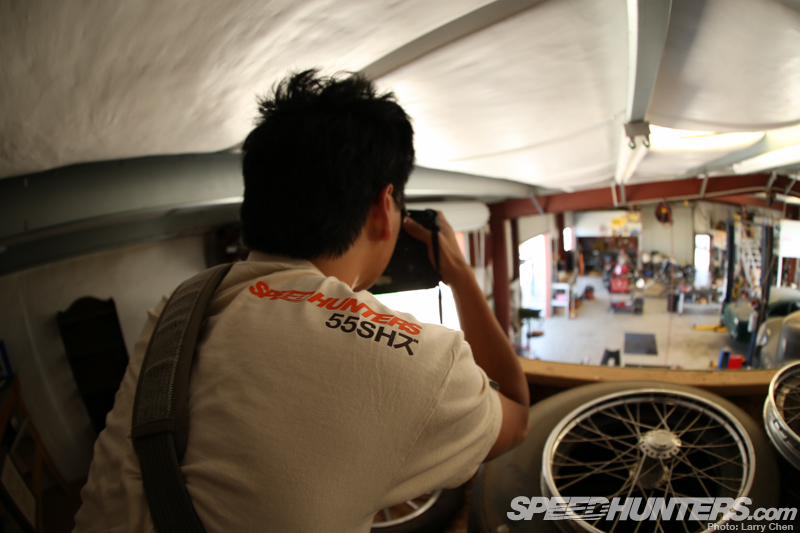 While a lot of Speedhunters shoots are solo endeavors, this most certainly was not. The team for this particular day included Mr. Rod Chong, who had flown in from Europe with our new Editorial Manager, Suzy Wallace. 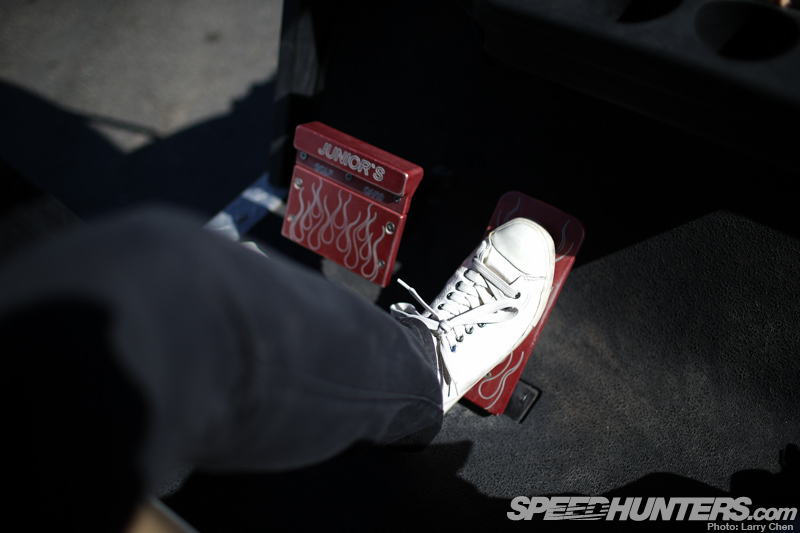 For Rod and Suzy, the Famoso visit was just one part of a packed itinerary that included Formula Drift Long Beach and other shoots in the Southern California area. 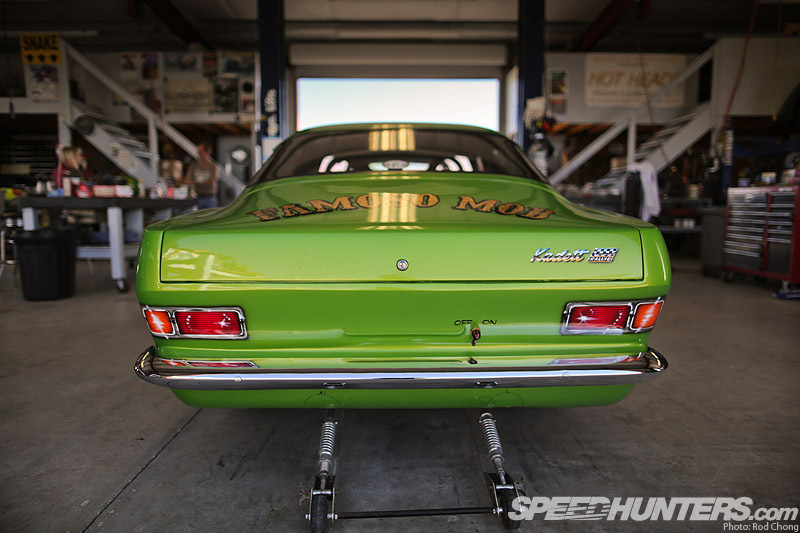 … as well as Sean Klingelhoefer, who’d also be pointing his lens at some of Famoso Speed Shop’s big horsepower creations. 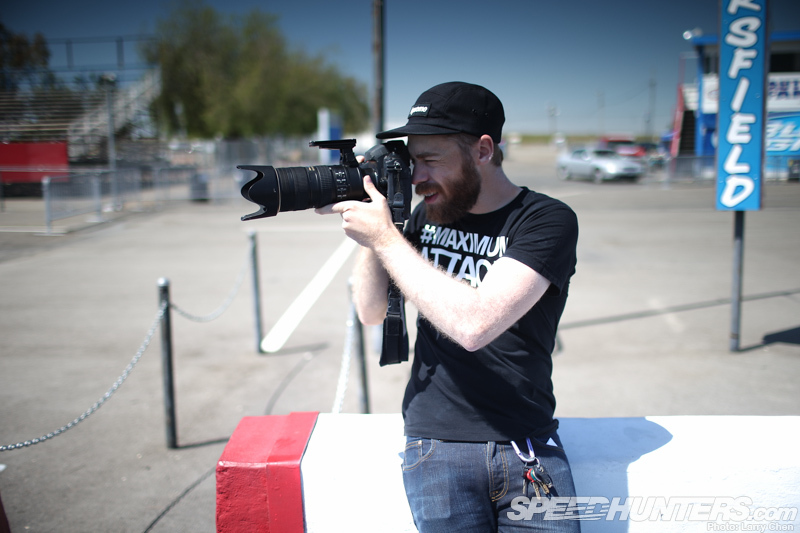 With the exception of Keith Charvonia (who helped to arrange the entire shoot), the entire Team USA division of Speedhunters was on hand. While a lot of our shoots are set up around a specific single vehicle, sometimes we show up and find a treasure chest of feature-worthy machines. That was definitely the case on this day. 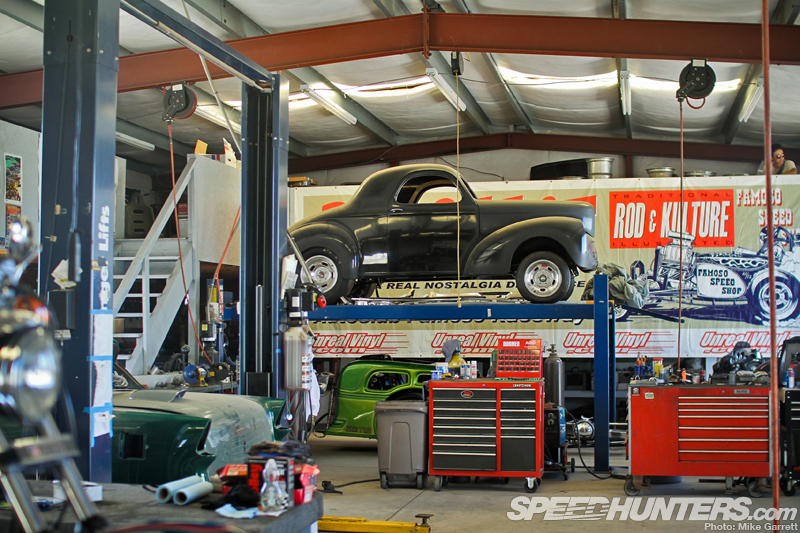 Randy and the Famoso Speed Shop crew seemed to have an endless supply of proper quarter milers tucked away all over the place. It was a good thing we had a big team on hand, because there was a lot to capture. After chatting with Randy for a bit, we came up with a game plan that would include two groups working separately to shoot cars individually. 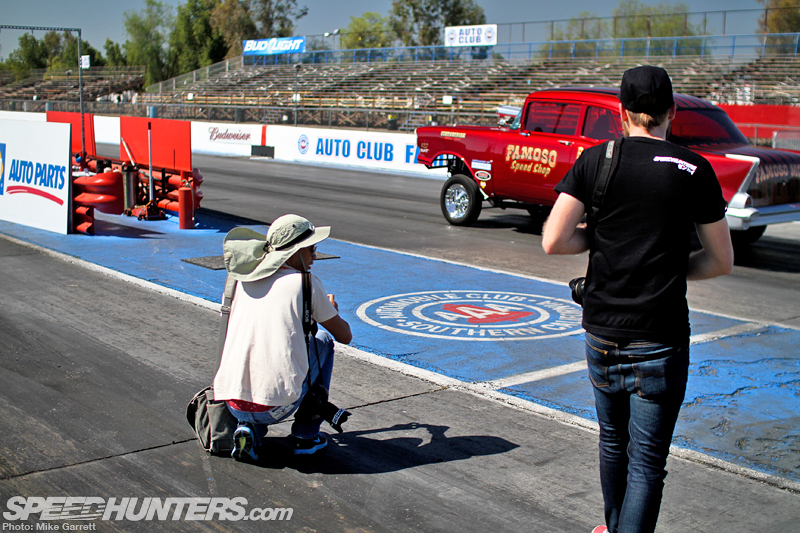 Part of the shop’s garages are located at Famoso Raceway itself, so there was also the unique opportunity to use the historic drag strip as a backdrop for some of the feature shoots. 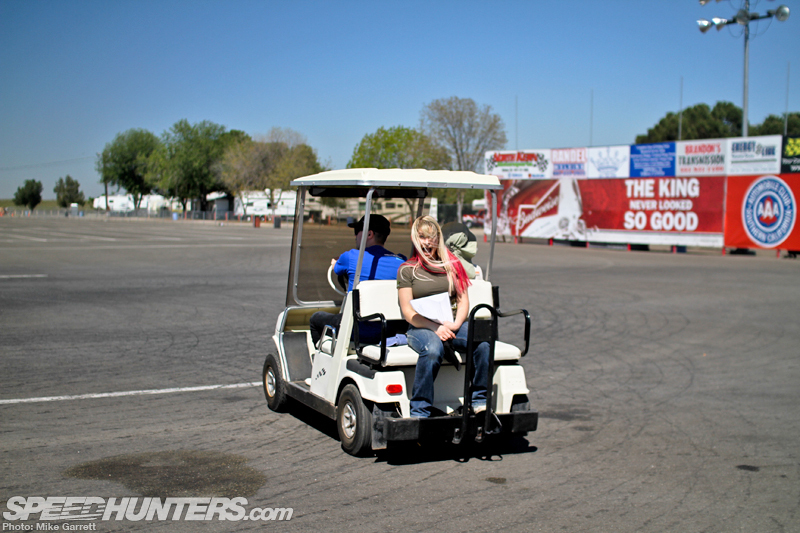 Now the Famoso Raceway facility is rather large, so fortunately the guys also let us borrow a couple of their golf carts to help get us get around during the shoots. Never lift! 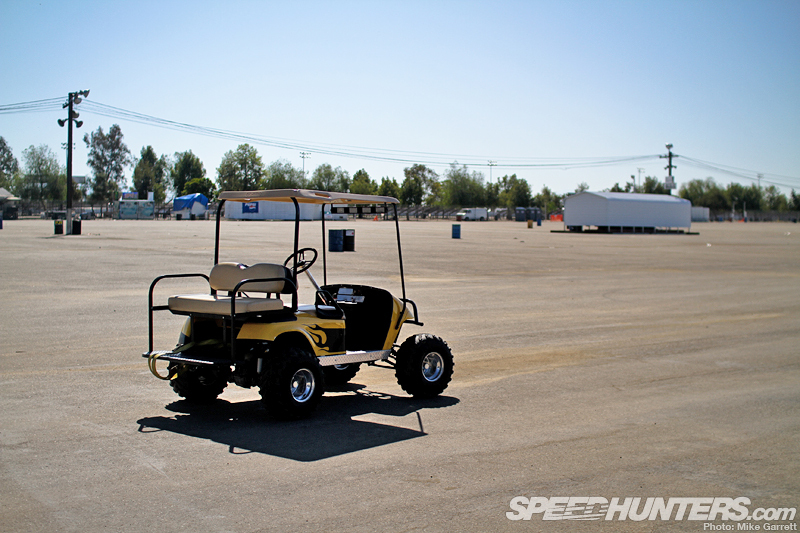 We may or may not have made a couple of full throttle passes down the old 1320 to see what these little golf carts could do. Suzy certainly seemed to be enjoying the thrilling golf cart antics. So with the cars set in position on the strip, it was time to get to work. I’ve been to Famoso for countless events over the years, but to see the track almost entirely devoid of cars and people was very strange. We pretty much had the entire place to ourselves. 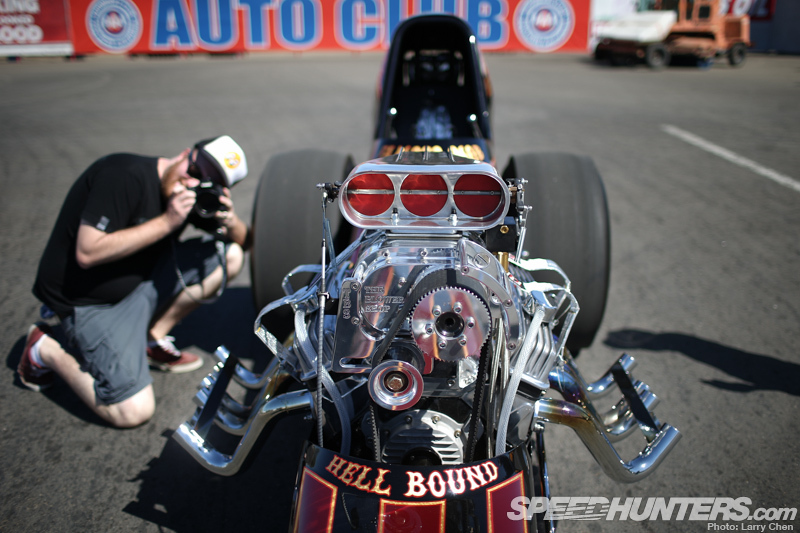 Sean’s particular photo subjects would be Famoso Speed Shop’s front engine rail dragster as well as its ’57 Chevy Gasser. In terms of a professional photoshoot, this one was fairly straightforward using only natural light. 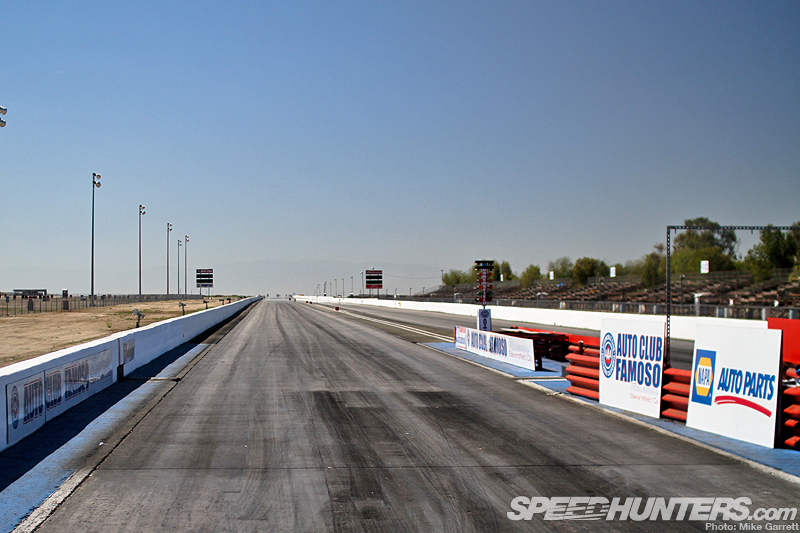 The idea was more to present the cars in their natural habitat: the drag strip. 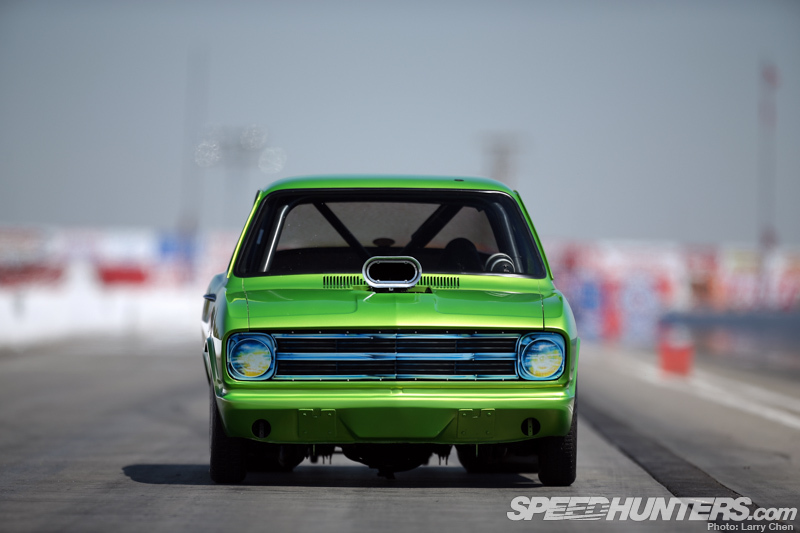 While a lot of photographers like to shoot at ‘magic hour’ when the lighting is low and just right, Sean didn’t seem to mind the bright midday sun that was coating the drag strip. He also used the opportunity to test out some of the latest photo stance techniques he’s been studying. 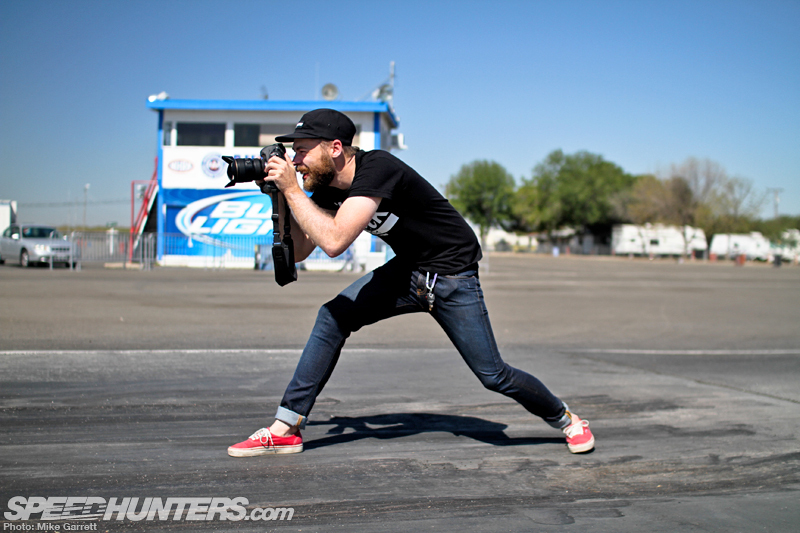 Did you know that prior to becoming a photographer and journalist Sean was also a professional figure skater? So graceful! When you shoot a car you want to take as many shots as possible, even if you only end up using a small fraction of them for the final feature. The idea is to come back with a variety of angles and shots from different focal lengths, and of course we aim for a mix of both full car shots and detail shots. 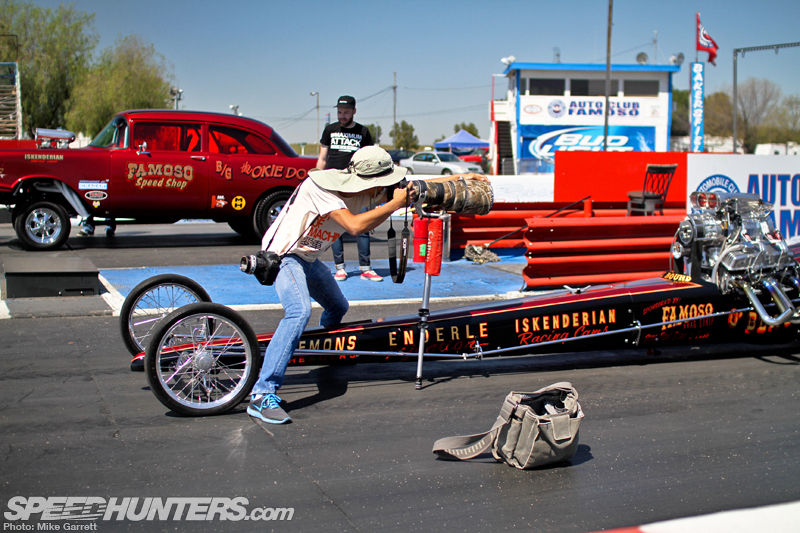 The rail dragster proved particularly tough to frame given its abnormally long size. A photographer is always looking for ways to change up the composition of a shot, and even something as simple as hopping up on a wall can make a huge difference when looking through the viewfinder. 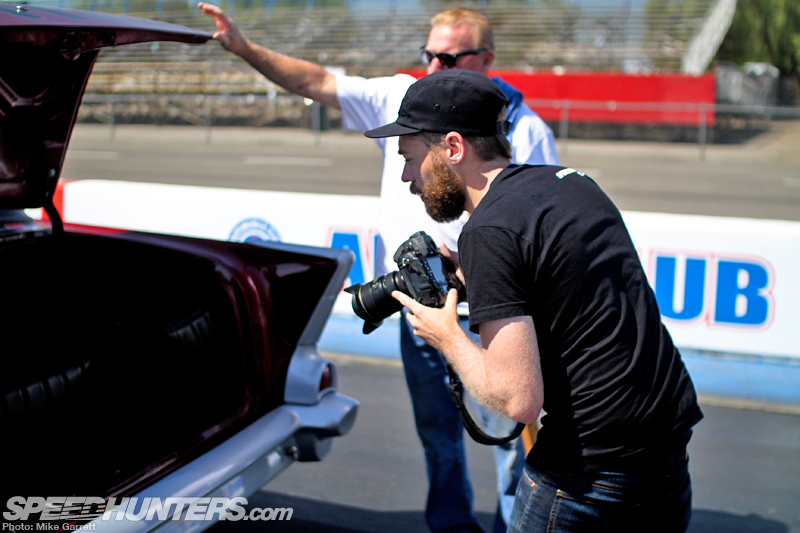 Since Sean is partnering up with Keith for these particular car features, he had with him a specific list of detail shots that Keith had requested to be included. These writer-photographer pairings are something we’ve been doing a lot more of lately and so far the results have been quite good. It’s also important to to talk to the owner as you are shooting their car. 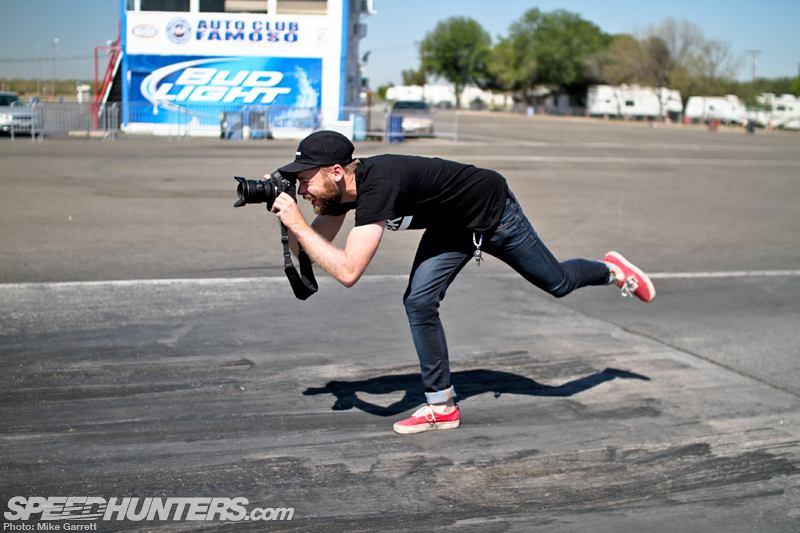 It’s easy for a photographer to get tunnel vision and completely miss important details. Plus there’s always cool little touches that might not be immediately noticeable until after the builder points them out. 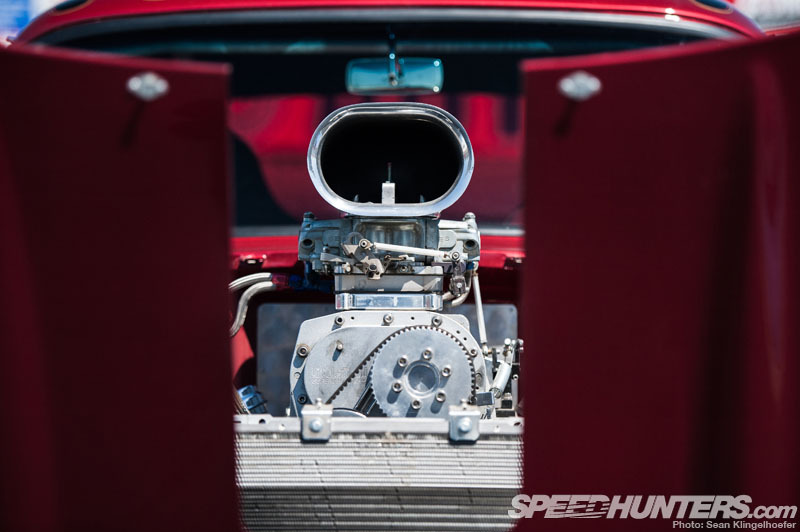 Combine these detail shots with a well-composed selection of full car shots and you have yourself a nicely rounded feature shoot. … and telephoto shots that increase the depth of field and help to isolate the car from the background. 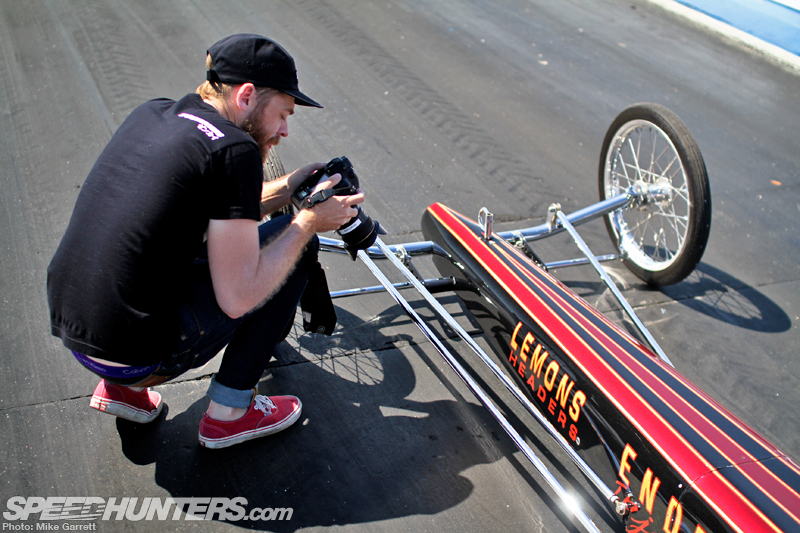 In Sean’s teaser shots, you can see that he worked in some unique angles of the rail dragster and the ’57 Chevy. 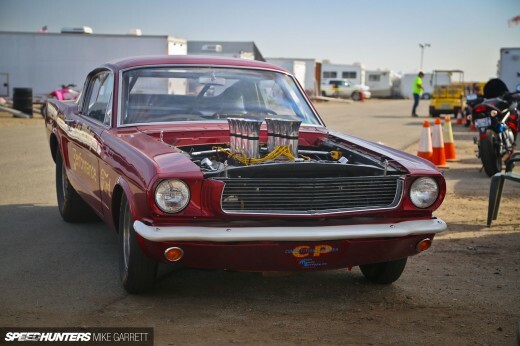 And while both of these cars are quite a bit different from the usual cars Sean has shot, things like one-piece front ends make for some very cool composition possibilities. 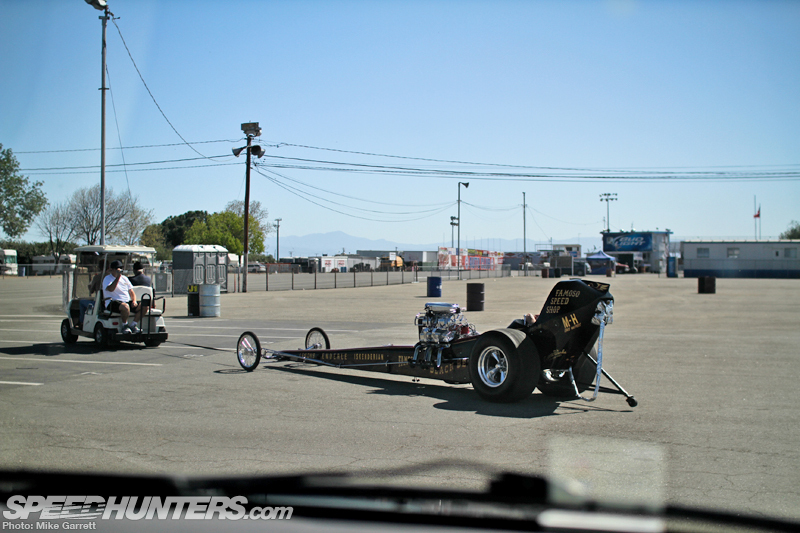 Or in this case we see Larry using the locale of Randy’s driveway to make for a visually interesting composition with the fuel coupe. 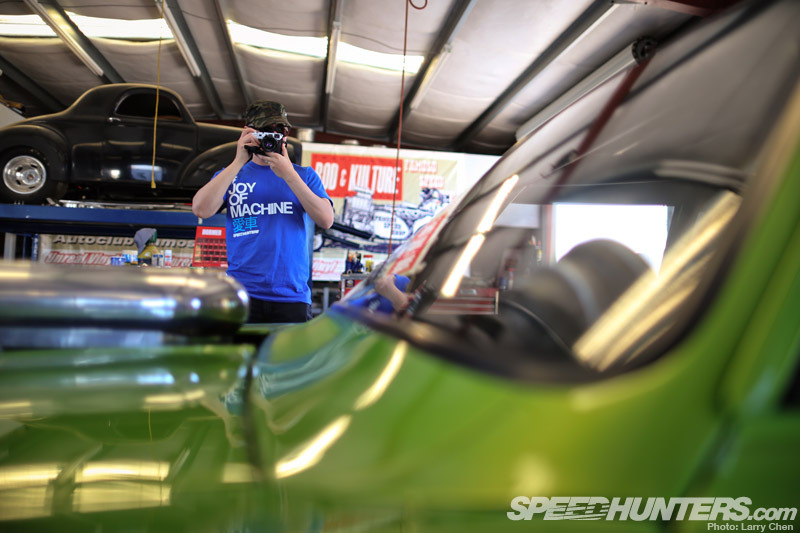 While Larry and Sean worked their cameras, I spent most of my time talking with Randy about the cars and the shop, gathering information for the upcoming stories. …and then the scene through Larry’s. Amazing isn’t it? I’ll go ahead and give you a moment to pick your jaw up from the floor. Here you can see Larry using his 400mm bazooka lens to photograph what I can only assume are individual atoms on that supercharger. 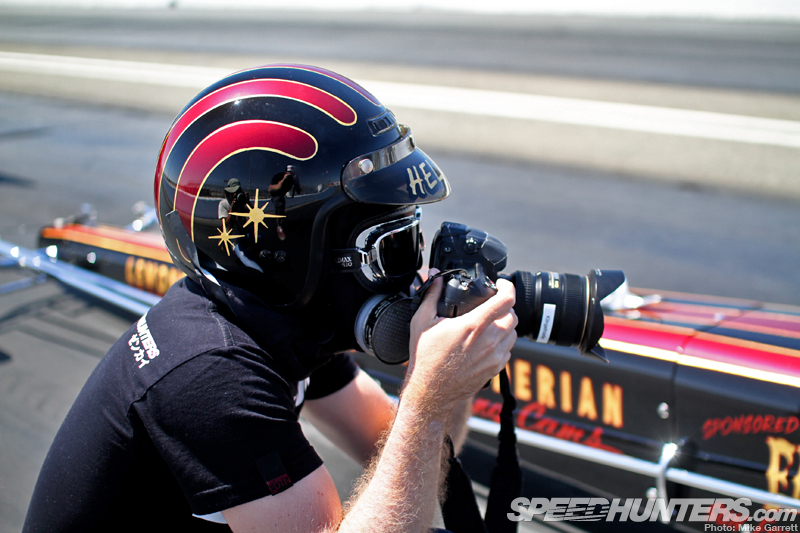 After the guys showed us the period correct helmet, goggles and face mask used for the rail dragster, it was inevitable that we’d ask to borrow them for a minute. Sean volunteered to be the model. 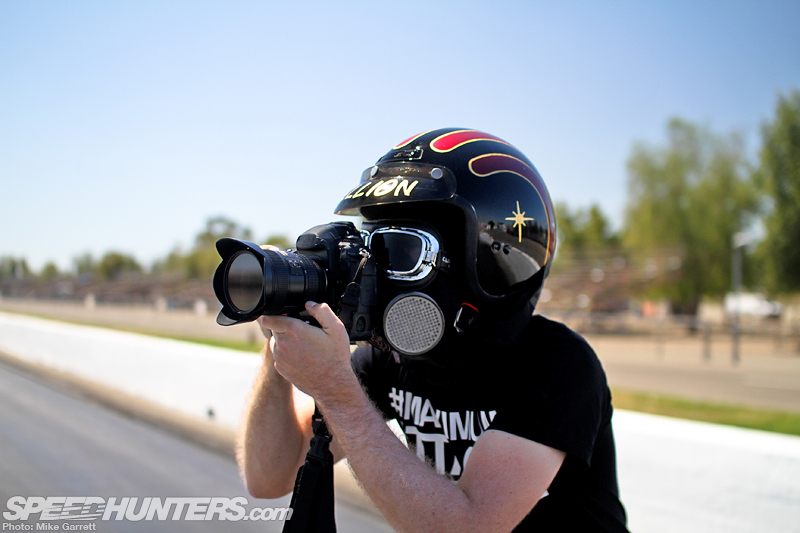 It was at this point that he stopped being Sean Klingelhoefer and became MAX ATTACK – the new Speedhunters mascot. It doesn’t matter that the mask is hot as hell and incredibly hard to see out of, I think this should become a required item for all photoshoots from now on. 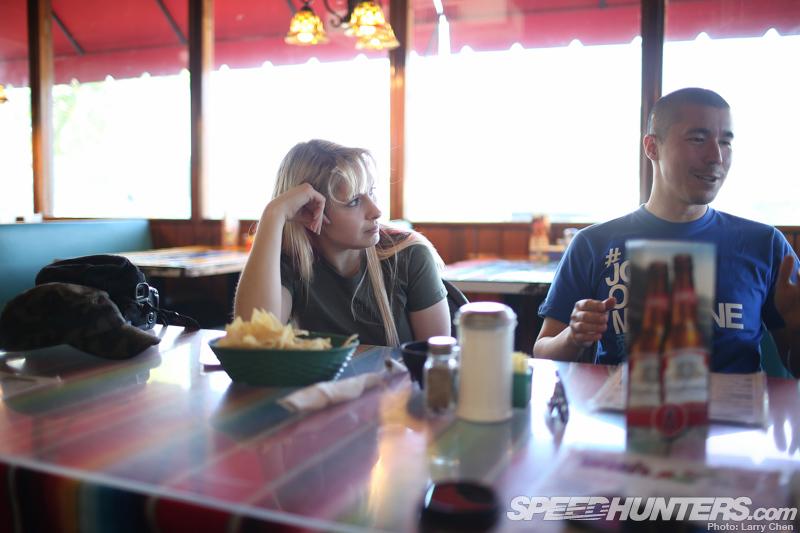 By the time the dragstrip shoots had finished up, we were long overdue for lunch. So at the request of the visitors from Europe, Randy directed us to his favorite Mexican restaurant. As you might imagine, a good burrito isn’t the easiest thing to come by in Stockholm or London. But besides the food, it was a great opportunity to have some good old fashioned conversation. 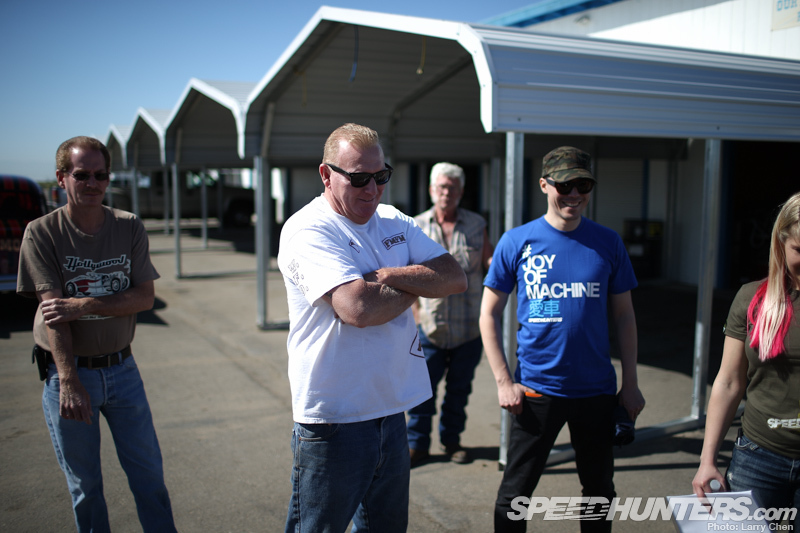 It was fascinating to hear Randy’s stories and also to share with him some of the cool stuff going on in other car scenes around with the world. As you often find, really talented builders are way more open to other scenes than you might think. Randy was extremely impressed when Rod told him about some of the builds he’d recently come across back in Sweden. 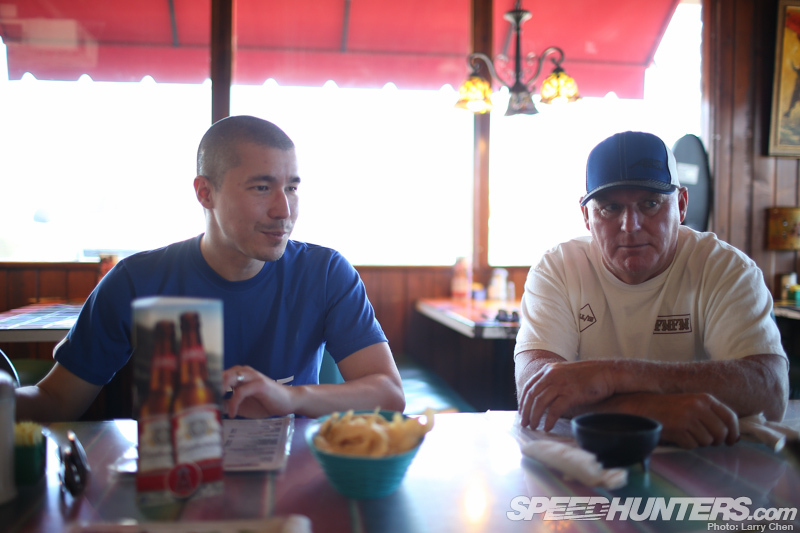 For me it’s these casual exchanges that are one of the most enjoyable parts of the Speedhunting experience. 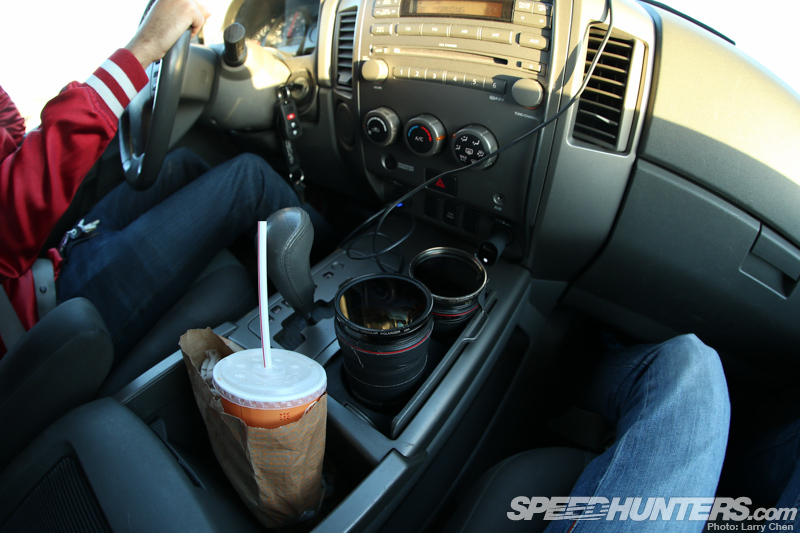 When were driving back to the shop in Larry’s Nissan Titan workhorse, I noticed he was using the truck’s cup holder to store his Canon L-series glass. No, those aren’t those coffee mugs made to look like lenses either. Once we were back at the shop, Randy and his friend Dusty rolled out their wickedly awesome fuel coupe so Larry could grab some shots. I’ll just say it’s probably a good thing these guys don’t have any neighbors. I decided to use this time to have a closer look around the workshop, which you can read about in our upcoming shop profile. 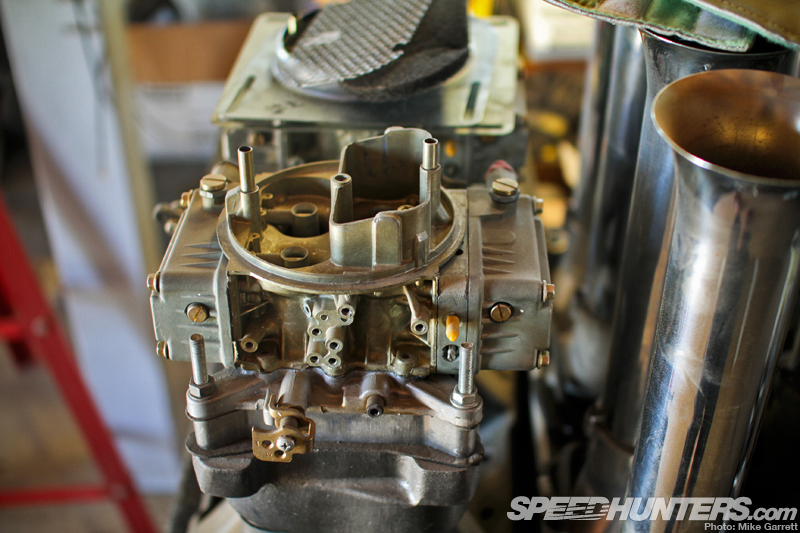 The process behind shooting a shop is quite similar to a car feature. The idea is to mix a selection of general shots with those showing close-ups of some of the interesting artifacts that are always around. At one point I had completely lost track of Larry while I was looking around the shop. Then I heard a familiar shutter click from above and saw that he had climbed onto the storage loft for a better angle. This sort of exploring is second nature to seasoned photographers. Nowhere is off limits! “I feel like I’m in school again” – Randy’s words after filling out the spec sheets that go along with the feature cars, which was the day’s final order of business. 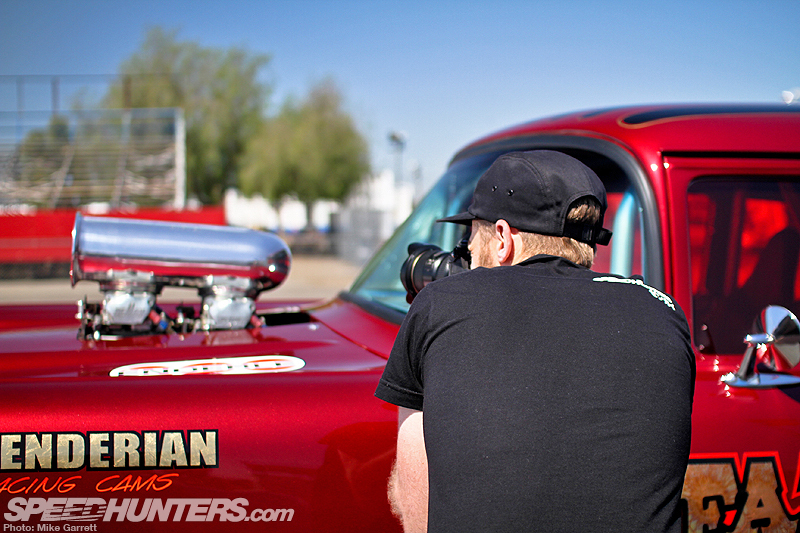 In the end, it was an extremely productive day resulting in several feature car shoots, a shop tour and more. 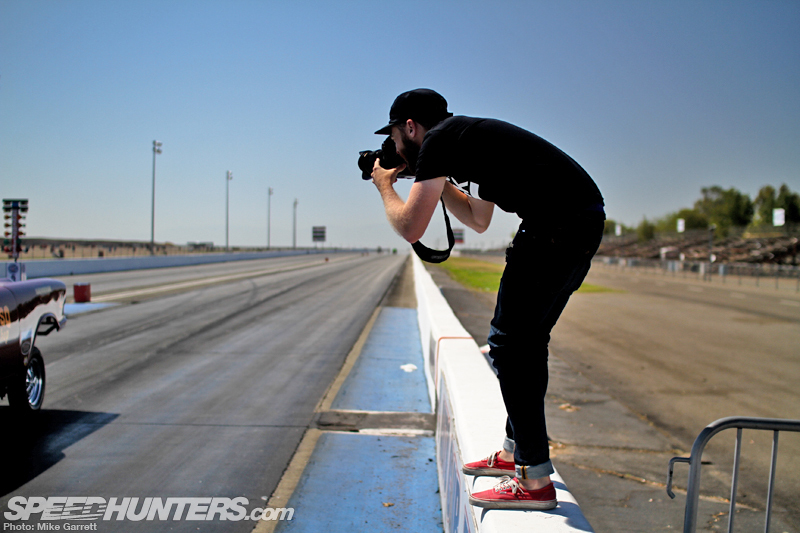 But more than that, it was a day that exemplifies everything that’s great about being a Speedhunter. 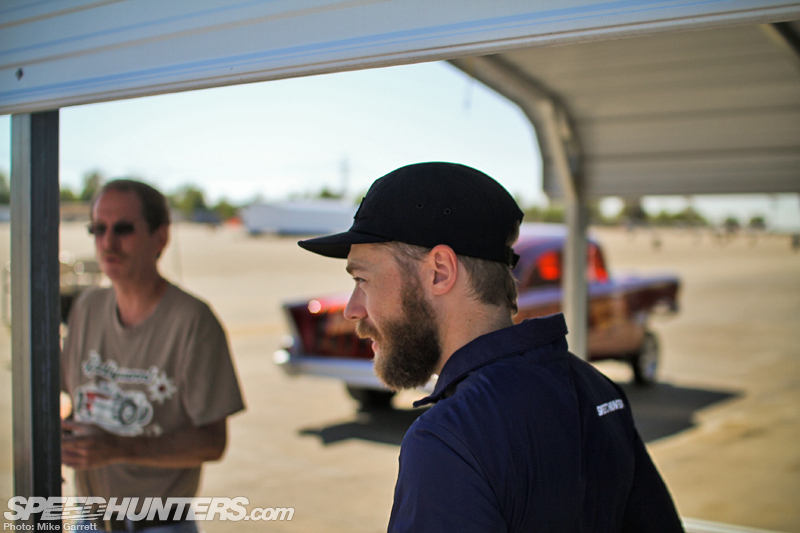 Cool cars, interesting people, fascinating conversation, and a fair bit of joking around. I wouldn’t want it any other way.